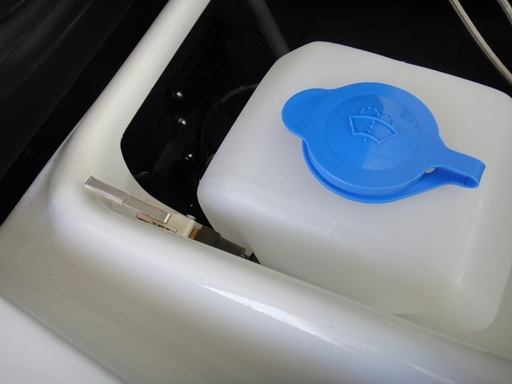 The front ‘boot’ section of the S1 Lotus Esprit was never finished quite right from the factory. Even on the best of cars straight from the factory, the finish of the fiberglass was pretty rough looking. 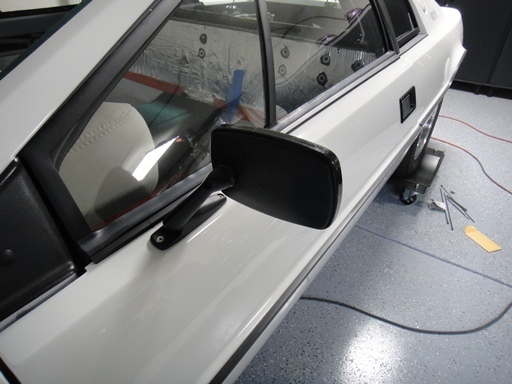 When the car was being prepared for paint, I spent some time evening out areas where there were major imperfections like air pockets, delaminated fiberglass, dry matte in areas, etc. After the car was painted, I re-masked the area and had it sprayed with the same ‘Line X’ type coating that I finished the wheel wells with. 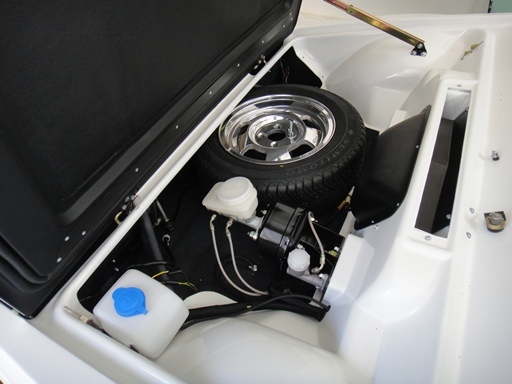 From there everything started to go back in, starting with the brake and clutch cylinders and stainless steel lines to complete the hydraulic systems. Then I wired the cooling fans, turn indicator and fog lights, headlights and headlight motor, as well as secured the relays, wiring and grounds. 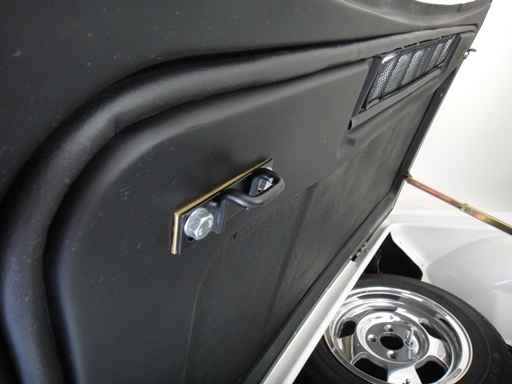 I installed a new windshield washer bottle as well as the ‘hood release’ micro switch that sits just above it. 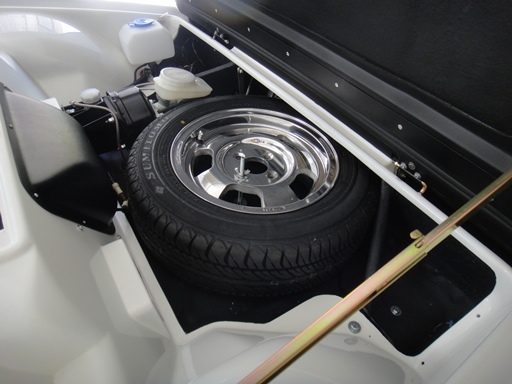 The last step was to re-install the spare wheel and tire, where I fabricated a new mounting bracket that makes it easier to remove everything when I need to. It’s looking pretty good now! 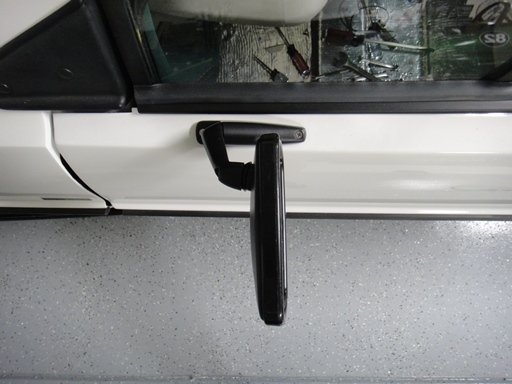 The Raydot mirrors used on the S1 Lotus Esprit are hard to come by, mostly because they were used on the S1 and a few other cars equally as rare. After a long search I was lucky to find a decent pair on eBay and grabbed them quickly. After a little work to bring them back to life, I installed them back on the car to complete the job.